William Lee 'W.L.' 'Man' Marshall, Jr.
William Lee 'W.L.' 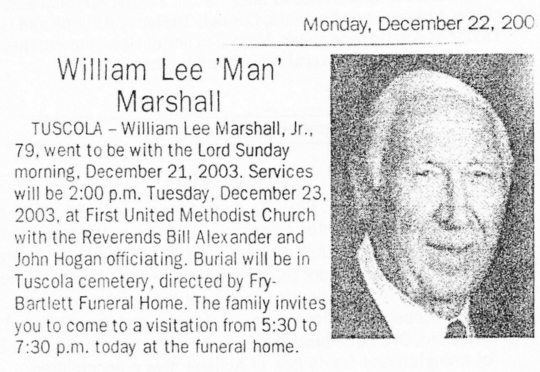 'Man' Marshall, Jr., son of William Lee 'Bill' Marshall, Sr. and Allie Mae 'Ted' Cunningham, married to Marjorie Laverne 'Marge' Faris and buried in Tuscola Cemetery, Tuscola, Taylor Co., Texas.